Beef Olives 38 Cut steaks from the Rump, or inside of the Sirloin half an inch thick, about six, long and four or five broad, beat them a little and rub them over with the yolks of an Egg, and strew on some crumbs of bread, some chopped parsley, suet or marow, and lemon peel, pepper, salt, and grated nutmeg, roll them up tight, and skewer them, fry, or brown them in a Dutch oven, then stew them in strong beef broth, till tender, thicken the gravy with a little flour, & add catchup & lemon juice. To make it richer add pickled mushrooms, hard yolks of Eggs, & force meat Balls. To ragout a breast of Veal. 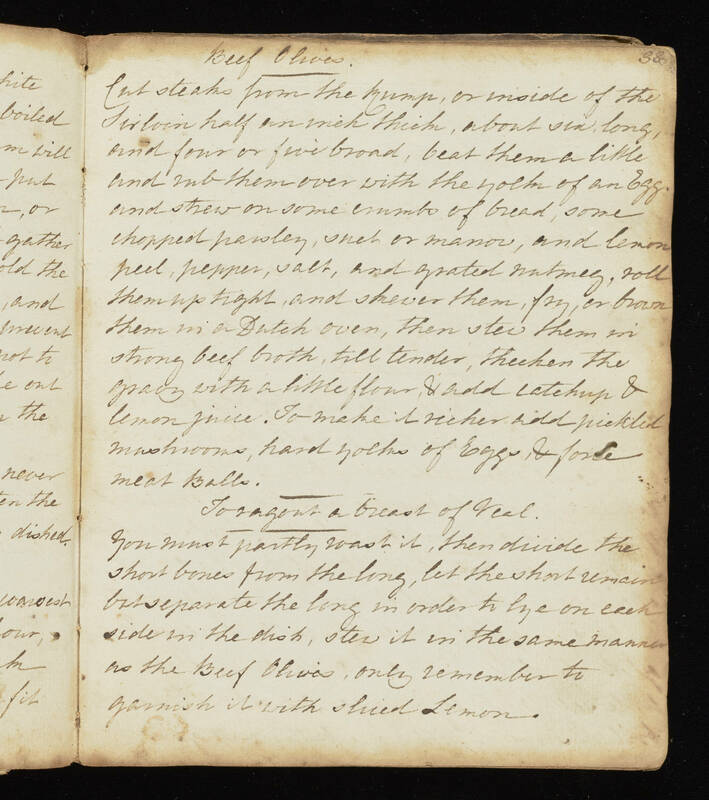 You must partly wash it, then divide the short bones from the long, let the short remain but separate the long in order to lye on each side in the dish, stew it in the same manner as the Beef Olives, only remember to garnish it with sliced Lemon.